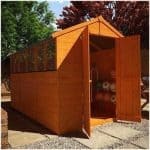 If you want a high quality shed, but do not want to pay over the odds for it, then the Hartwood 8′ x 6′ FSC Pressure Treated Overlap Apex Shed gives you all the benefits of a high priced shed, but without the large price tag. This is a very decent sized shed that offers you plenty of floor space as well as a generous amount of headroom as well. The shed really does have a great look thanks to that rustic sawn cut cladding and those two good sized windows that do not just make for an attractive feature, they are also going to let in lots of natural light. 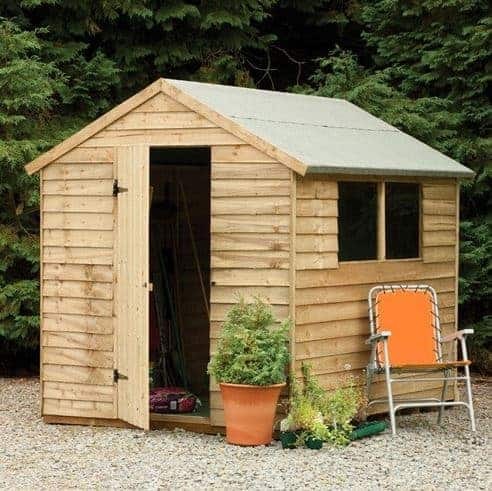 At a glance you can tell the Hartwood 8′ x 6′ FSC Pressure Treated Overlap Apex Shed is one fantastic looking shed, but it does not really do anything to jump out and grab your attention. But as you look closer, you start to see just how well made and cleverly designed this shed is. The actual structure is just over 6 feet wide and 8 feet wide so inside the shed there is plenty of room for you to store many different items. We feel that larger things like bikes, mowers and even the kids toys that they use outside in the summer would fit in here and still leave you plenty of space to make use of. We are pleased with the headroom offered by this shed as along the ridge you have over 6 feet of headroom and the eaves are just over 5 feet high so you could even add some shelving here if you wanted to. The first thing you notice about the apex roof is the heavy duty mineral felt that they have used. This is very strong and will not tear as easily as cheaper made felt. This is used to cover the solid sheet boarding that makes up the roof. 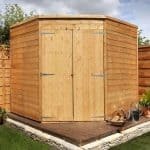 This kind of boarding is perfect for a shed like this as it is not overly expensive and it is also more than strong enough to do what it is required to do. As all of the wood has been pressure treated that gorgeous, sawn cut overlap cladding is extra strong. At 8 mm thick it has a really sturdy feel to it and is ideal for families as it can take some abuse from the kids. We just love the way this cladding looks, but as we all know life if not just about looks there has to be something else there too and there certainly is with this cladding as it is made to be tight and strong so that wind and rain cannot get inside. Like the cladding the framing is also very strong. Using a 28 mm x 28 mm frame is a decision that we have to give them two big thumbs up and a cheesy grin for. 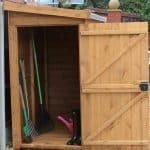 This makes the shed very robust and will be one of the main reasons as to why 20 years from now you are still able to store things and have fun with this shed. So that you can store plenty of heavy items in here like your weight lifting set or treadmill that seemed like a good idea 5 years ago. They have used a strong solid sheet boarding that can take a lot of weight. So if you do have heavy tools or a mower that is heavy then this floor is able to handle them and other such heavy items very well. We also really like the way they have spaced out the floor joists as it makes the floor much stronger. 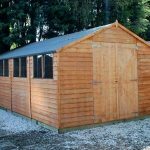 The pressure treatment process that the Hartwood 8′ x 6′ FSC Pressure Treated Overlap Apex Shed is put through actually makes this more low maintenance than a shed that is just dip treated. 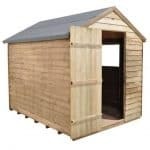 You do not have to treat this every year like you would a shed that has not been pressure treated. Still if it does give you peace of mind then a coating of wood treatment is not going to do it any harm. They give you a 15 year anti rot guarantee and that is because of how sure they are about their pressure treatment process. The door really does look awesome as the vertical cladding they have used goes very well with the overlap cladding that makes up the walls. This door may be a single sized door, but we do not see you getting all stressed out when trying to get something in or out of the shed. The door is very solid as well as they have used three large braces on the back of it, sure we would have really liked to have seen a ‘z’ brace on here, but the braces they have used will still do the job. As the hinges are so strong, you will not have to worry about this door sagging and getting out of its place as the years go by. One side of the shed has two windows which is a very nice touch. To be honest we thought that one window would be enough on a shed of this side, but we are really glad that they put two on here as it is going to allow natural light just flood into the shed. Now the windows do not open which is a little disappointing, but they are well made as they are constructed from 2 mm thick styrene. The shed comes with a hasp and staple so that the door is not just swinging and banging in the wind, driving you crazy at 3 AM. We do like this as it will keep the door shut, but a padlock or even a proper lock is something we would have liked to have seen. Still as a padlock can be purchased for as little as a pound it is not really a huge deal. As there are those two good sized windows located on one side of the shed, you will find that this is a rather open shed. If this is a concern then you could always install the shed so the windows are not facing the street or your nosey neighbours house. 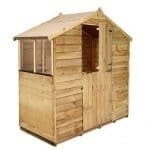 Also some curtains or even blinds would work and also give the shed a little bit more personality. No actual customisation options are offered with this shed which is fine by us as it’s one less thing to think about. 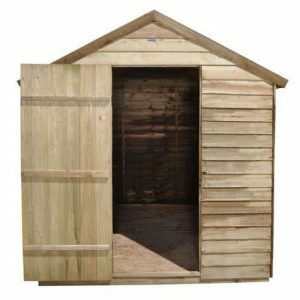 However if your garden does have a particular style then we are sure that in any colour this is a shed that is going to retain its rustic and old school charm. While we are perfectly happy with a cheap and cheerful padlock if you want something a little more high quality and cool looking then they do have a Yale Hasp Steel Black Finish 120 mm and Brass 40 mm Padlock for a cost of £19.99. If you want something that is a little more high tech and looks like it was possibly made by Iron Man, then they do have a Yale Super Durable Deluxe Shed Alarm Security Kit which is available at a very reasonable £29.99. 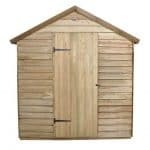 It is not just the pressure treated wood that makes this a high quality shed, pretty much everything about this is very well done and in general we really are impressed with what they have done. 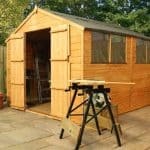 You are going to get many years of use out of this shed and it is only going to require a very little amount of effort from you in order for it to stay looking great. The materials have been selected very well and we are sure this is going to give you well over a couple of decades of use. This is a shed that offers many possibilities. The floor space is good and you can add shelves thanks to the generous eaves height so you really can put a ton of things inside here. We would not recommend taking this on by yourself, so be sure to get a friend who you can handle spending time with for 4-6 hours and get them to help. This is not something that is overly hard, but it can be a little fiddly in some places so be sure to take your time. At under £300 we feel that this is a shed that really is well priced. 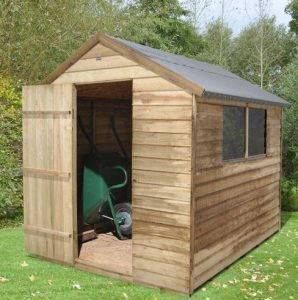 Final Thoughts: The Hartwood 8' x 6' FSC Pressure Treated Overlap Apex Shed is the kind of shed where the complaints we have about it really are quite trivial as honestly this really is one incredibly well made shed. It has certainly been built to last with the pressure treated wood and the materials that have been selected in general. Also 8 X 6 is just a fantastic size that is ideal for pretty much anyone from a family to a person looking for a place to keep their gardening equipment. 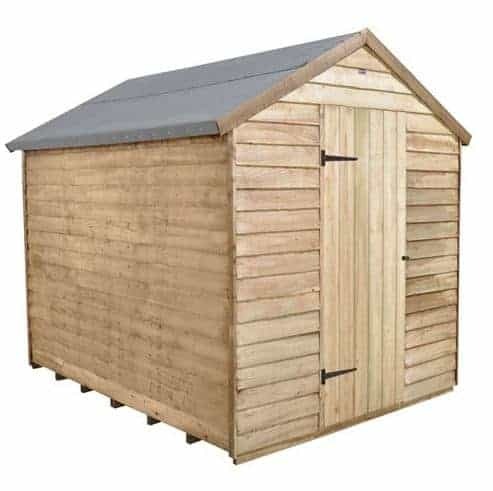 This is a shed that is very easy for us to recommend and if you want something that offers storage space as well as some old school charm then this is a shed you simply must consider.